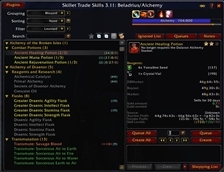 Skillet is a replacement for the default tradeskill and craft UI. What are the numbers in the middle and how to hide them? Green = How many you can make from materials you have. Yellow = How many you can make by crafting the reagents. Orange = How many you can make if you purchase materials from a vendor. Purple = How many you can make using materials on your alts. Right-click on the bag icon above the numbers. How to retrieve items from bank? - Turn on "Display shopping list at banks"
How to turn off Skillet temporarily? - Shift+Click your profession button/link. It also works for View All in your Guild Tab. Twitch installed the nolib version. Is that right? If Skillet works then Twitch did the right thing. I'm not a Twitch expert. I've been doing addons since before Twitch existed. why is the crafting interface so hard to understand? This could be my main crafting tool but its too hard see how many recipes you can make with my mats! Over 12,000 people have downloaded the latest version of Skillet and you are the first person to complain about the interface. If you can elaborate on why you think it is "hard to understand" (i.e. some specifics) I might be able to help. For your specific "too hard to see" I believe the first FAQ entry will help. In the following graphic the 3 combat potions show the numbers "in the middle"
To change which numbers show, right-click on the bag icon above the numbers. The next time you update this, think you could make the "Queue" button as the default action? When I'm queuing up crafting items, it'd be nice to type in the quantity to make and press "Enter" key to queue it up. That just comes/seems natural to me. Hopefully , I'm not asking much. This would also require an option to enable it as I'm sure some of the other 10,000+ users might complain. So I don't forget, please open an enhancement issue on our Project Site. Wow, this is actually a very nice addon. But due to it's name and/or twitch's lack of search options, it sure was hard to find. I think I've tried out almost every crafting addon and never found this one. For those of us still using TSM3, this is a nice replacement for it's crafting module. I'm a bit confused. Are you asking redroach these questions? If so, ignore this response. If not, please open an issue on our Project Site . I can't reproduce your queue issue so I'll need more information. Interacting with the mail box is completely different than interacting with a vendor. It is very unlikely that Skillet will add such a feature. Skillet 4.07 has been released. Please open an issue (ticket) on our Project Site if you find any problems or inaccuracies (and be specific, examples and/or screenshots are very helpful). Is there a way to only show alliance/horde only on the shopping list? Doing the retrieve and getting mats for a toon i can't mail it to or send it too gets a little redundant. Since Skillet was created before you could have Horde / Alliance on the same server it was not designed to make that distinction. I'll look into how hard it would be if you would open an enhancement issue on the project site so I don't forget and so you can help with the debugging. What line in the .lua do I edit to revert the color of the top bar to it's original color. I don't like the neon green, it's too jarring. Ah, I see. Thanks for the directions. Tried and love it. Much better than TSM in my opinion. I have one request thou in case it was not implemented and if was I could not find it. There isn't a sort by type but there is a filter by slot. There is also the ability to create your own group(s) of specific recipes. Hopefully, those are enough options for you.